I’m still in Australia for a few more days. A six-word story summary of Brisbane for Americans: Midwestern culture, Miami climate, Alaska prices. 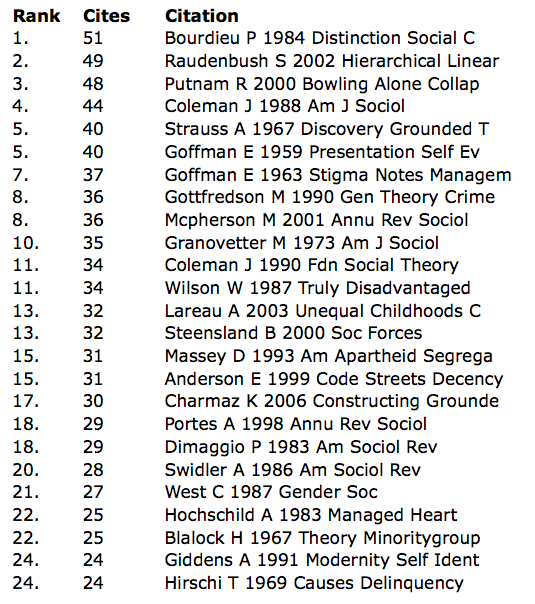 Because December is the season for making lists, I’ve updated my sociological navel-gazing to create a 2012 edition of the most cited items in sociological journals. Since there is no widely accepted list of sociological journals, I include those journals* where the majority of authors who list a department in their mailing address list one that includes the word “sociology” and which have a significant US editorial presence.† This totals 47 journals and includes all the ones you would expect along with some less widely-known journals, like Social Politics. I downloaded the 1,563 research articles published in these journals between December 1, 2011 and November 30, 2012 from Web of Science. That took nine–just nine–clicks, which isn’t so bad. For each article, I counted up which books or articles they cited, and then summed it all up. Journals that published frequently and publish lots of articles (like Social Science Research) or journals where authors tend to cite lots of things (like AJS) probably have undue influence by this measure, but simply counting the number of times something has been cited is a pretty good first pass at seeing what is being commonly referenced. If you want to waste some time, here’s the full list. So, one in 33 articles cites Distinction. The majority at the top of the list are books along with a pair each from AJS, ASR and the Annual Review, along with one article from Social Forces. The authors and titles are truncated by Web of Science, so don’t blame me. Remember that the lists only counts citations in this group of sociology journals, so being famous in other worlds doesn’t get you on the list. Fun fact: 2/3 of things that were cited last year were only cited once, and 95% of things cited were cited less than five times. And, unless one of your articles was cited nine or more times in one of these journals last year, you can consider yourself, like me, one of the 99%. One thing that struck me was how old everything on this top list was. The median publication year in the top 100 was 1992. Of the top 100, only one piece was published in the last five years. The author ended up at boarding school for future investment bankers, so there is a price to pay for influence. More generally, things aren’t that bad. 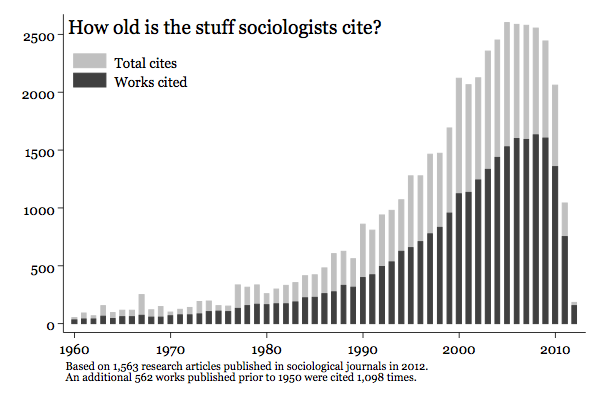 It turns out that the average thing we cite is ten or eleven years old. There is a lot of factors that go into what items get cited and how many times, such as the number of papers published in an area or the degree to which there is a common puzzle or cannon in a subfield. But we don’t seem to be in a hurry to cite new stuff. Or alternatively, we aren’t easily swayed by the newest research trend. I don’t know how that has changed over the long term, but I just ran the numbers for articles published in 2009 in the same set of journals and got the same median lag of ten years. On a side note, it’s my understanding that Journal Impact Factors are often computed using citations to articles published in the last two or five years. Last year, 93% of the stuff we cited was more than two years old and 78% more than 5 years old, further complicating these measures. * Social Science Research (110 articles); Sociology of Health & Illness (77); Journal of Marriage and Family (73); Social Forces (52); Demography (48); Journal For the Scientific Study of Religion (47); Sociological Forum (45); Deviant Behavior (44); American Sociological Review (40); Population Research and Policy Review (35); Poetics (33); Sociological Spectrum (31); International Migration Review (31); Sociological Quarterly (30); Social Networks (30); Journal of Health and Social Behavior (30); Review of Religious Research (29); Sociological Inquiry (28); Criminology (28); Social Compass (27); Symbolic Interaction (26); American Journal of Sociology (26); Gender & Society (25); Mobilization (25); Annual Review of Sociology (25); Socio-economic Review (25); Theory and Society (24); Teaching Sociology (23); Journal of Contemporary Ethnography (23); Ethnography (23); Punishment & Society-international Journal of Penology (23); Rural Sociology (23); Sociological Methods & Research (22); Social Politics (22); Homicide Studies (22); Qualitative Sociology (21); Sociology of Education (20); Social Problems (18); City & Community (17); Feminist Criminology (17); Sociology of Religion (16); Sociological Theory (16); Theoretical Criminology (16); Work and Occupations (15); Social Psychology Quarterly (12); Journal of Mathematical Sociology (10); Sociological Perspectives (10). I might be missing the last issue from a couple of journals because they haven’t showed up in Web of Science yet. You snooze you lose. 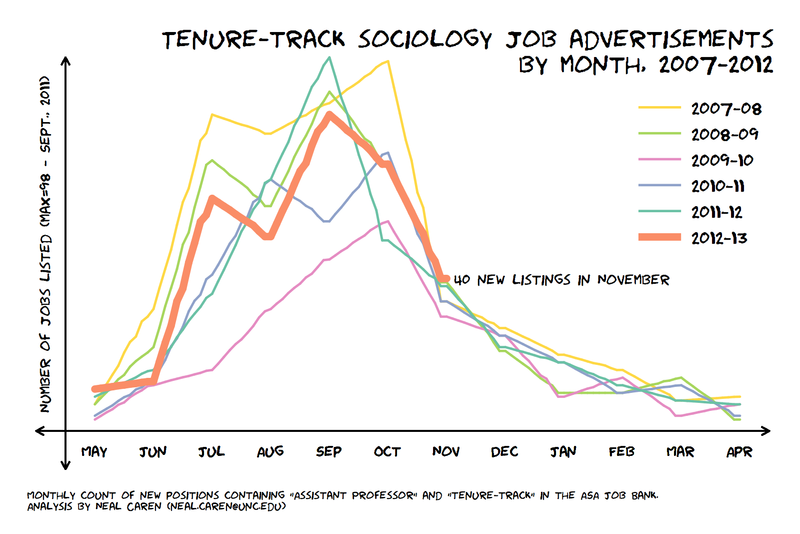 † My method of identifying sociological journals doesn’t really work for non-US journals as it appears non-US folk are much more likely to lists themselves in things like “School of Social Policy.” Sorry. You can ballpark the effect of including these journals by adding 327 cites to Giddens’s Modernity and Self-Identity and including a couple of works by John Goldthorpe to the list. [Between 2009 and 2012], according to Pew, support among baby boomers (ages 48 to 66) has grown to 41 percent from 32 percent; among seniors (over age 67) to 33 percent from 23 percent; among Generation X (ages 32 to 47) to 51 percent from 41 percent; and among millennials (ages 18 to 31) to 64 percent from 51 percent. As Shamus and others have remarked, this is a very dramatic shift, which is very unusual for public opinion. Cohort turnover, rather than changed minds, explains most changes in opinion over time, but this issue is different. I don’t envy those researchers who collect and analyze retrospective family history surveys. The data can be a real mess. Mark Regnerus recently released the raw data from his New Family Structure Study (NFSS). I thought that many researchers would want to reanalyze the study, so I attempted to put together a Stata do file that replicates the original analyses that were published in Social Science Research. I’ve also posted my version of the full regression tables, which weren’t in the original article. The article is quite clear on how most of the items were constructed so it wasn’t too difficult to put this together for most of the variables. The items that were most difficult were those dealing with family structure growing up. I haven’t been able to get my numbers to match Regnerus’s for all the different types of families. Largely this is because the item being measured is quite messy with multiple overlapping categories. If someone else can figure out how Regnerus got his numbers, specifically the step-parent and single parent categories, please send me the code and I’ll incorporate it in my publicly available do file. An additional problem when analyzing the data is that an individual’s answers are often quite contradictory. While sometimes this can create sociologically interesting questions, like under what conditions do people change their self-identified ethnic/racial classification, other times you just want a decent operationalization of the concept, like how many respondents lived with two moms? After submitting an article to a journal, I have received a revise & resubmit decision along with two reviewer reports. The changes suggested by the reviewers and the editor seem reasonable and doable. However, it has occurred to me after I received the reports that the statistical model I used has limitations. These limitations had neither occurred to me before, nor were they noted by either of the reviewers or the editor. I think the sound thing to do would be to change the model and the data for this are available, but I am concerned about how this will look to the reviewers and the editor.